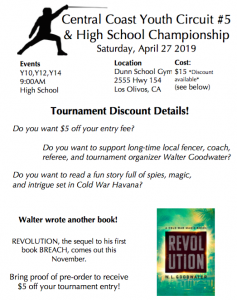 The 2018-2019 Youth Championships will be Saturday April 27th at the Dunn School! The flyer is posted below. The Youth Events will start at 9am. There will also be an E and Under Foil Event after. The Link for the E-Under registration is HERE. If you have any questions or are unsure about what is going on feel free to contact your coach or reach out to us on Facebook. Hope to see you all there to finish our year out and support our local fencers! The Highlanders fencing club will be hosting the next youth tournament on March 9th! There will also be a high school epee event, a gear table, and a veterans epee in the afternoon. For more information check out the flyers listed below. 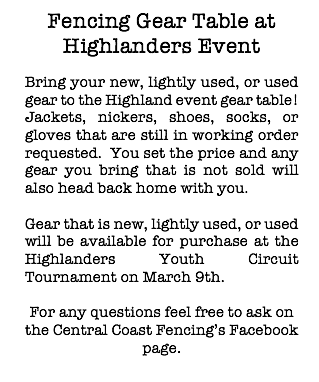 There will also be a special medals ceremony for our Event #4 medalists so please come support our Central Coast Fencers! Hope to see you all there. 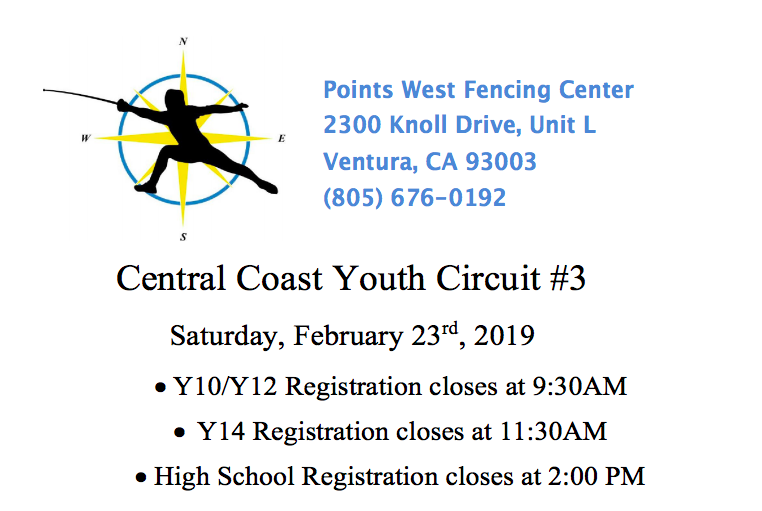 On February 23rd Points West in Ventura will hold the third youth event of the season. There will be a Youth 10, Youth 12, Youth 14, and High School Foil Event. Please also note that a folding chair or popup would be a welcome addition, as the facility does not have spectator seating. If you have any question about the events or the time check the flyer below. Hope to see everyone there! Congratulations to all of our youth medalists and attendees this past weekend. The trial run of High School Epee also went really well! A shout-out to the Cal Poly fencers and coaches who helped referee and run the Highlanders Tournament. Just a quick note that Cal Poly will be hosting an unrated Saber & Epee tournament this Sunday January 27th. There is a limited amount of space so be sure to register HERE at AskFred if you would like to participate. The next Youth Circuit Event will be hosted by Points West on the 23rd of February. This one will have the Y10/ Y12/ Y14 foil as well as the High School foil events. If you have any questions or concerns, check our CCFF Facebook page here. There will soon be someone to answer! Thanks to all of you drivers and supporters of the Central Coast Fencers too! The Youth Circuit in Los Olivos will be the first event of the 2018-2019 fencing season! Hope to see you all there! Don’t forget there is an E and Under after for our competitive fencers 13 or over. Register at askfred to avoid last minute fees. 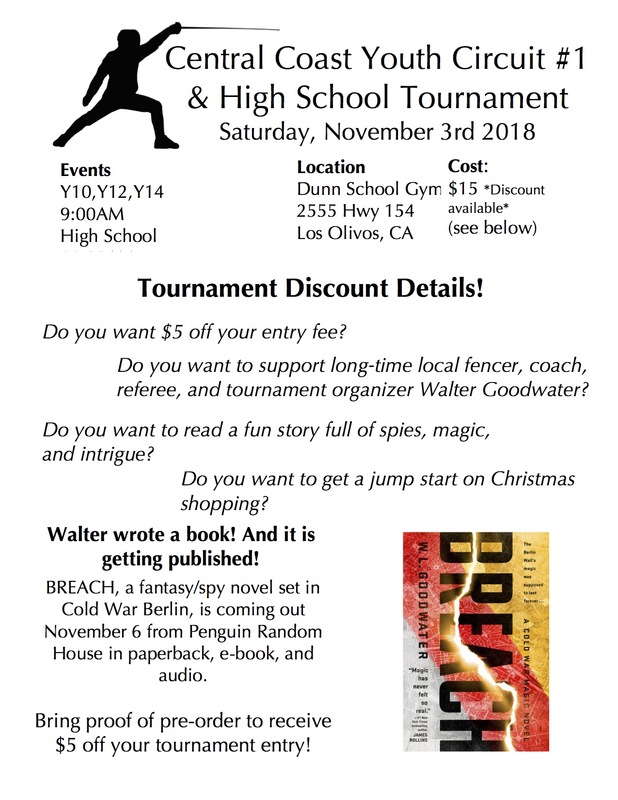 November 3rd Youth Circuit #1 in Los Olivos! The November 3rd tournament has been confirmed!! Below is the flyer for our event. Please note the other news for our league. Hope to see the youth fencers, friends and family there. There will also be an E and under USFA foil event which can be registered for at AskFred. Note that there is a new equipment retirement if you wear a plastron for foil. Feel free to ask your coaches and happy fencing. 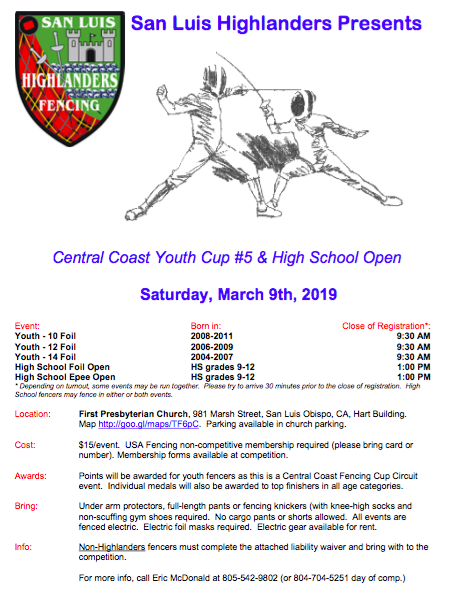 Welcome to the 2018/2019 Youth League Fencing Season! The events for the 2018 / 2019 fencing season are on the calendar now. I hope you can participate! We have some exciting events and a few new possibilities including team events at the clinic and epee exhibitions for our cadets. Be sure to come back for more infromation as details unfold. We look forward to seeing all of our youth fencers and families having fun and participating at this years events. Happy Fall!! The last event for the 2017-2018 fencing season has been postponed. The event is now tentatively scheduled for May 12th. We will let you all know when the date is finalized. Happy Spring! March 10th at Points West just around the corner! Thanks to all of our participants and volunteer help for the Highlanders Tournament. The next youth even will be March 10th at Points West in Ventura. Hope you can make it! 2017 Youth Circuit Competition #1 At Los Olivos! There will also be an E and Under Foil event at 2pm. Email: chair@centralcoastfencing.org if there are any questions or concerns. Hope to see you all there.